A visitor was bitten and scratched by a grizzly bear on Friday evening while hiking on the Savage Alpine Trail in Denali National Park and Preserve, according the National Park Service. Fangyuan Zhou, 28, was hiking with friends when she encountered a small, juvenile grizzly bear on the trail. They made efforts to avoid the bear and played dead when the bear eventually charged at them. The bear scratched and bit Zhou before walking away from the ground. The bear returned several minutes later, but it was chased off when one of Zhou’s group members threw rocks at it. After the attack Zhou, received medical care from park service staff before she was taken to an Anchorage-area hospital. Zhou’s group wasn’t the only one to encounter the bear, as several other groups were on the 4-mile trail, and a group of approximately 10 people had encountered the bear before Zhou’s group. In accordance with park guidelines, the group was able to drive the bear off by grouping together, shouting, and waving their hands, according to park officials in a press release. Playing dead—the technique Zhou used, is also a valid method. However, it is only recommended when contact with the bear is imminent or has already occurred. Playing dead can prematurely arouse a sense of curiosity in the bear, park officials say. The particular bear involved in the attack is already quite familiar among visitors and staff. The bear had previously been involved in several major incidents, including charging, biting and scratching, and stealing food from hikers. Park officials say that they are no longer able to tolerate the safety risk the bear poses to visitors and will soon kill the bear. 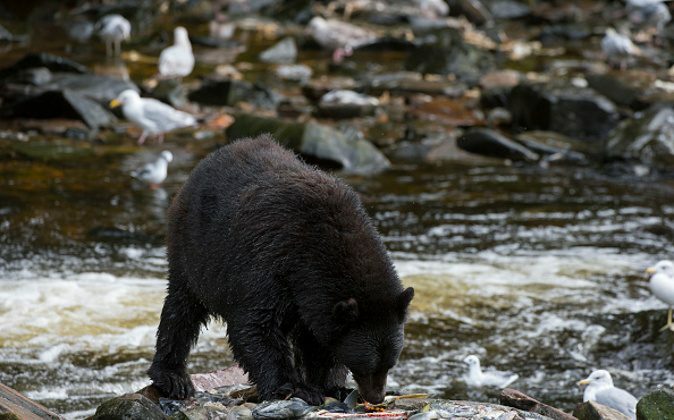 “The erratic behavior of the bear over the past two weeks: approaching and charging several groups of hikers; biting and scratching a hiker;obtaining food from a hiker; and its general interest in people represents an unacceptable risk to safety in the highly visited front country of the park. Park staff will locate and kill the bear as soon as safely possible,” the NPS press release reads.